We’re working hard behind the scenes to bring some exciting new thrills to Oakwood for our guests this year. We will shortly be adding Dizzy Disk – an exhilarating family ride that will see riders face outwards as they glide back and forth all while simultaneously spinning in circles – it’s sure to be a hit with everyone! 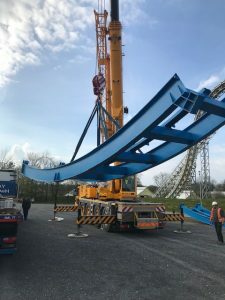 As you can see, work is underway at the park bringing the ride to life and we’re excited to unveil it a little later in the year once its ready, with final installation and commissioning taking place over the coming weeks. And, if the opening of Dizzy Disk isn’t exciting enough, 2019 will also see the return of the phenomenal Bounce and more surprises are in store too!